New York Yankees' Alex Rodriguez reacts after hitting a grand slam to tie the game 4-4 in the eighth inning of a baseball game against the Atlanta Braves. 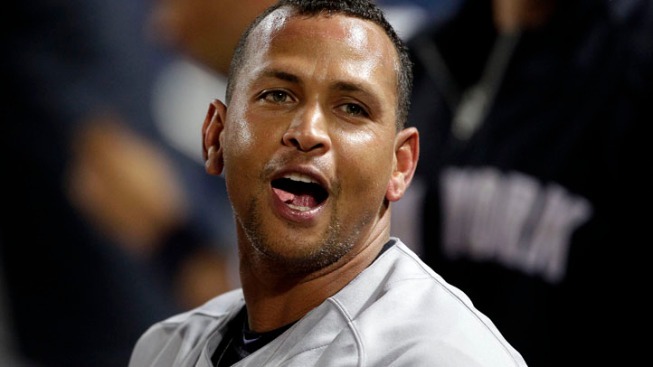 Alex Rodriguez took a grand swing into the record books Tuesday night, and now stands shoulder to shoulder with Lou Gehrig. Rodriguez hit his 23rd career grand slam, matching Hall of Famer Gehrig's record, and the New York Yankees scored six runs in the eighth inning to rally for a 6-4 win over the Atlanta. Nick Swisher hit a tiebreaking two-run homer off Cory Gearrin two batters after Rodriguez connected against Jonny Venters. The Yankees had been only 10 for 67 (.149) with the bases loaded this season before Rodriguez hit his tying shot. Minutes later, Rodriguez paused to savor his shared place with Gehrig in baseball history. "It means a lot," Rodriguez said. "It's very special. This game is very, very difficult. If you're not going to enjoy these great moments, then it's not any fun. Lou Gehrig is not only one of the all-time greats, but he's one of ours." The Yankees matched their season high with a fifth straight win and moved into sole possession of first in the AL East when Tampa Bay lost to the Mets. Yankees manager Joe Girardi said it was "absolutely incredible" for Rodriguez to equal Gehrig's mark. "It's hard to fathom what he's been able to do in his career," Girardi said. "To be mentioned with Lou Gehrig, that's special." CC Sabathia (8-3) left trailing 4-0 after seven innings but was the beneficiary of the rally. The big lefty gave up four runs on a season-high 10 hits with two walks and six strikeouts. Rodriguez was aware of the Yankees' struggles with the bases loaded. "I almost felt like it was a swing for the team," Rodriguez said. "I felt like everybody needed that hit. We've all been waiting for it, but it definitely feels good to pick up our big man CC and to give our team a win." The Yankees have won 10 of 12. "What a game, right?" said a giddy Swisher. "It just goes to show you, you've got to play all 27 outs. We're that type of team. I think we're very resilient. We don't back down from any challenge regardless of what we're up against. "Rod with that grand slam, that will tell people how we hit with the bases loaded," Swisher said. "It was awesome." Rafael Soriano, who pitched in Atlanta from 2007-09, retired the Braves in order in the ninth for his 10th save of the season and the 100th of his career. The Braves, who wasted a strong start by Mike Minor, have lost three straight. Rodriguez had been 1 for 10 this season with the bases loaded before he lined the full-count pitch from Venters over the left field wall. Braves left fielder Martin Prado barely moved as he watched the homer clear the wall. "I made a bad pitch and he crushed it," Venters said. "I have no excuses. I felt great mechanically. I felt great physically. I just fell behind some hitters. ... I threw a pitch right down the middle, 3-2, to one of the best hitters in the game. "I feel bad I let my team down," he added. Rodriguez's homer was his 10th of the season and first grand slam. Minor gave up five hits and one run in 7 1-3 innings. He was pulled after giving up a one-out single to Derek Jeter in the eighth. "You feel comfortable with a four-run lead and five outs to go," said Braves manager Fredi Gonzalez, who revealed that another left-hander in his bullpen, Eric O'Flaherty, was not available due to a sore arm. "I think we pushed (Minor) as far as we could push him, really," Gonzalez said. "And he did a hell of a job. It's a shame he didn't get the W."
Venters (3-3) loaded the bases, allowing a single to Curtis Granderson before walking Mark Teixeira to set up the tying grand slam by Rodriguez. Venters, who did not record an out, then gave up a single to Robinson Cano and was lifted. Swisher followed with his 10th homer for a 6-4 lead. Matt Diaz hit a three-run double in the first to give the Braves the lead they kept until the eighth. Diaz started ahead of Jason Heyward in right field for the second time in three days when the team faced a left-hander. Diaz had two hits off Toronto's Ricky Romero on Sunday. Michael Bourn led off the first with a single and moved to third on the first of two doubles by Brian McCann. Sabathia walked Dan Uggla to load the bases. Sabathia faced a similar jam in the seventh. With one out, Prado hit a soft single to right field and moved to third on McCann's double. Sabathia issued an intentional walk to Uggla, loading the bases for Heyward, who replaced Diaz in the seventh. Heyward drove in Prado with a groundout to second base.